Just weeks after the Canadian penny was pulled out of circulation, the single most famous one-cent coin ever produced in this country — an “exceedingly rare” and valuable 1936 “dot cent” stolen from a U.S. collector in 1964, then mysteriously returned to him — is set to be sold at an American auction this April for at least $250,000. The penny was one of just three known to have been created by the Royal Canadian Mint at a time when the nation’s coin-makers were scrambling to prevent a shortage of properly stamped coppers. To distinguish any new batch of coins that might have been required from the earlier production runs of 1936 George V pennies, a tiny dot was added in the space beneath the “1936” date of the posthumous prototypes, said to have been made in early 1937. Some experts believe that the potential coin shortage never materialized, so that just three “dot cent” samples were produced, along with limited numbers of similarly marked dimes and quarters. Others suspect thousands of the dimpled pennies were actually minted but later melted down for the first run of George VI one-cent pieces, dated 1937. 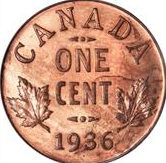 Two of the three documented 1936 “dot cent” specimens wound up in the hands of retired Royal Canadian Mint employee Maurice LaFortune of Ottawa. And by the early 1960s, that pair of pennies — as well as the third one, once owned by the widow of another mint employee from Ottawa — had been acquired for a few hundred dollars each by the legendary Rochester, N.Y., coin collector John Jay Pittman. Before his death in 1996, Pittman would assemble a treasure of numismatic rarities worth $30 million, with the three dotted pennies from Canada among his most prized possessions. The third of the three — and the one to be sold next month by Texas-based Heritage Auctions at its “World and Ancient Coins” sale in Chicago — has had a particularly intriguing history, having been snatched by thieves from Pittman’s home in 1964 along with a number of other valuable items. Then, inexplicably, the New York collector received an unsigned envelope containing — along with a few of his other stolen coins — the dotted 1936 penny with a slight scratch on the “3” of the date. Even if the penny sells for more than expected, it’s unlikely to surpass the all-time record price for a historic Canadian coin. A 1911 Canadian silver dollar — one of only three known to exist — was sold to a Canadian collector in 2003 for $1.1 million.